Bodegas Cayetano Del Pino Y Cia dates back to 1886 and was established by Don Cayetano Del Pino Vazques. Their wines were awarded gold medals in countries such as the Philippines, in 1895 and Egypt in 1901, as well as becoming official supplier to H.R.M. King Alfonso XIII. Today this bodega has transformed itself into an almacenista, focusing on the stockholding and ageing of Sherry. 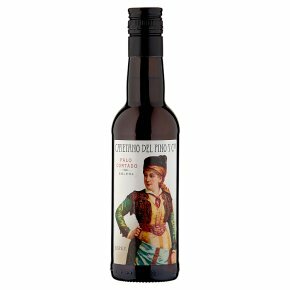 This is an excellent example of the rare Palo Cortado Style. It is an elegant wine with an intense nutty aroma and an attractive roundness on the palate, and impressive length of flavour from long ageing in butts. This wine has been bottled with very light filtration but no fining nor cold stabilization to obtain the maximum flavour in the bottle. It is possible that it may form a haze or precipitate tartrate crystals.